I love a well thought-out case, but I don't like one that's got too many bells and whistles or is too fiddly. The SF-800 fits nicely into the sweet spot for cases as far as I'm concerned: it's well made, solid but not too heavy, and there's quite a few clever little touches. For example, the entire front of the case is made up of 5.25" slot covers, and removing the front reveals 5.25" mount strips that run all the way from top to bottom. 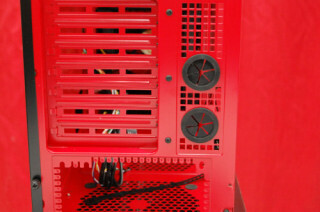 To mount 3.5" drives, there's a removable four-drive cage that features an LED fan (that lights up red) and vibration reduction material inside. 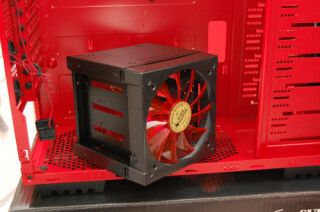 In addition, SuperFlower have provided a 5.25" slot cover that can fit a FDD-sized drive cutout, as well as red mounting brackets to match the case interior. To top this off, thumbscrews are used everywhere except for the motherboard screw mounts, so mounting a few hard drives in the cage, then mounting the cage in the 5.25" rails is a doddle and this "modular and adaptable" mentality really satisfies my fussiness when it comes to cases. I can arrange drives as I see fit in this case, allowing for cable lengths and connector positions on the motherboard. With nine 5.25" slots, it would make an excellent home storage case, combined with some 3.5" drive cages. 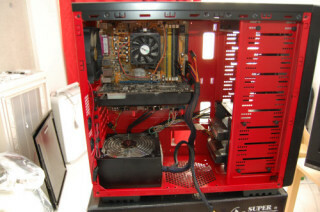 The front of the case also features four USB ports and two audio sockets - headphone and microphone - all of which use motherboard header connectors. The rear features the usual slots and so on, but the SF-800 also has two holes specially cut for water cooling pipes, complete with rubber grommets - this isn't something you usually see on most cases, so it's a nice touch. 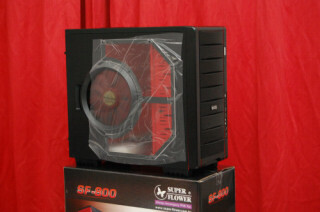 You'd be forgiven for thinking that the SF-800 is a bit of a wind tunnel in the making with 4 fans included - the massive window fan, one up the back, one on the top and one at the front, directing air over the hard drives. Surprisingly, they're not as noisy as I expected but there's still a fair amount of air moving through the case. 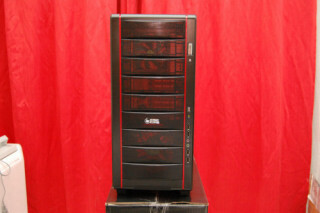 On the side of the case, there's a nice big clear acrylic window along with a massive 25cm LED fan (again, red). Windows are nothing new and to be honest, I'm not really a fan of them but this one is fairly sedate so it's not horrible - just a piece of acrylic and that's that. The big fan attached to it is a bit cumbersome when removing and replacing the door: cables like to bend around and hit the blades, but it's only a minor quibble and easily avoided. To be honest, I don't really care for the window or the massive fan on the side, so the option of a plain door would be nice, but that's a personal preference thing. Internally, there's no removable motherboard tray, but every single bit of metal has been painted red, which gives it a pretty nice contrast to the external black colouring. I initially thought I preferred the black option but after having the case sitting beside me for a few weeks, I'm sold on having the internal areas of a case painted a different, brighter colour - it looks far better than the window showing a big dark void. Even the bottom has some features - the feet are inch-high with cutouts that give it a very "off-road tyre" look, but they're hard plastic, not rubber. 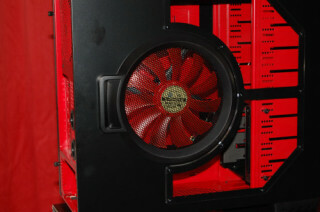 There's also two decent sized fan grills: one for an installed PSU and one for a fan or just extra ventilation. As for installation, everything was very straight forward. Even though it's not a massive case, there's plenty of working room and the ability to remove drive cages and open things right up make it very easy to work with. I really didn't have any issues and I'm completely sold on using thumbscrews for securing drives now. Overall, I had absolutely no problems with installation, although even with the modular cabling of the Crystal Plus PSU, SATA data cables and the like did turn into a bit of a birds nest, but there'll always be a bit of cable spaghetti no matter what. At least with the modular cabling, any cables getting in the road were actually serving a purpose, not just taking up space idly. Update: SuperFlower now have an Australian distributor, who have put the SF-800's price point at $99AUD. 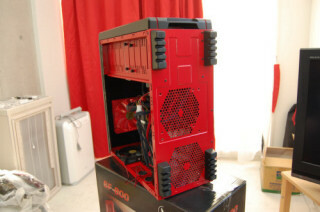 The case is intelligent in its design, giving the user a lot of flexibility to position stuff around as they see fit, and along with the room, the aesthetics and extra touches such as the water pipe holes on the rear and the removable drive cage make this an excellent 'general purpose' hobbyist case; it could easily see use as a gaming 'bling' rig, or as a drive-filled home server. Combine it with the $85AUD price tag and it's a bargain. I'd go out and buy another one if this one suddenly evaporated into thin air. The PSU is also recommended, primarily because of the modular cabling but also because it's decent looking, well made and does exactly what it's meant to. The $149 isn't exactly cheap, but it seems to be an appropriate price point for a PSU of this feature set and besides, multi-colour LED's light up when you plug the cables in - that's gotta be worth something. Many thanks to Henry at SuperFlower for the opportunity to perform this review.